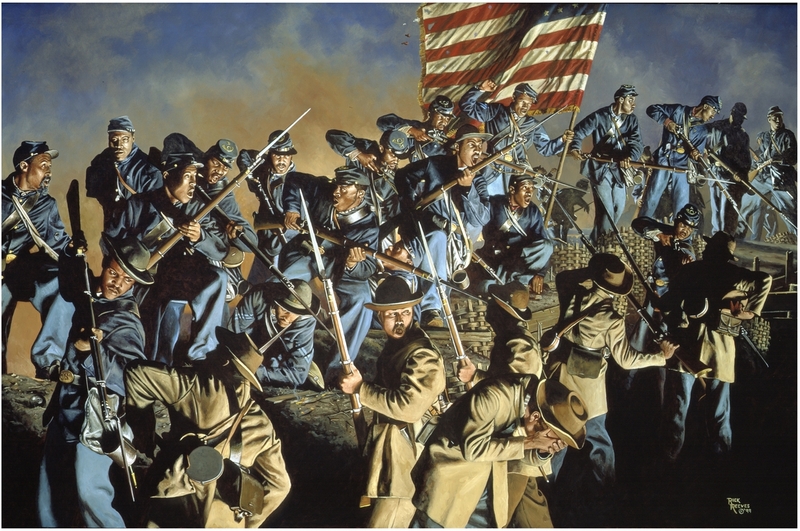 (About) The painting The Old Flag Never Touched the Ground, which depicts the 54th Massachusetts Volunteer Infantry Regiment at the attack on Fort Wagner, South Carolina, on July 18, 1863. Courtesy Rick Reeves, U.S. National Guard. Massachusetts Gov. John A. Andrew received approval from U.S. Secretary of War Edwin Stanton on Jan. 15, 1863, to recruit "persons of African descent, organized into special corps" to fight for the Union cause. Andrew hoped the new unit, the 54th Massachusetts Volunteer Infantry, would become a model for future regiments, whose success would confirm the capacity of blacks for military service. The 54th Massachusetts, under the command of Col. Robert Gould Shaw, trained at Camp Meigs in Readville in the Hyde Park section of present-day Boston. Recruits arrived from 24 states -- 15 Union, 5 Confederate and all 4 border states. Their professions included farmers, laborers and skilled tradesmen. On May 28, Andrew presented the regiment its colors. The 1,007 enlisted men and 37 white officers marched through Boston and embarked on the transport ship De Molay, destined for Beaufort, S.C. On July 16, 1863, the 54th Massachusetts saw its first action as part of a diversionary attack on James Island, across the Ashley River from Charleston, S.C. The first casualties totaled 45 men. Two days later, 600 men of the Regiment led a brigade-sized assault on Fort Wagner, located on Morris Island at the mouth of Charleston Harbor. The fort, constructed with a ditch and earthworks, was located on a thin spit of land, where the only approach was bordered by the ocean and a marsh. The 54th had no choice but to charge straight ahead into the fortifications. The attack was gallant, but disastrous. The unit was able to scale a single wall of the fort, but Confederate counterattacks forced the men in blue to retreat, suffering 116 killed in action, including its commander, Shaw, and 156 wounded or captured. The unit gained recognition for its valor and showed that black Soldiers would indeed fight if given the chance.